Looks like she needs one or two more sessions. You can still see traces along her jaw line, and from a couple on her cheek. Can’t tell if she’s had a nose job - I don’t see the hook any more, but if she got a nose job, she should have had a bit more taken off. There’s a very pretty girl underneath all that crap. She looked alright with ‘em. But I think she looks a lot better without ‘em. For some reason I don’t mind the ‘one side’ face tattoos as much as the whole face jobbers. 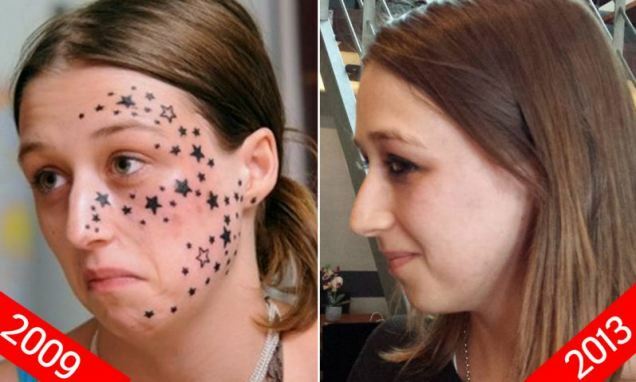 As far as face tattoos go, this star thing was not as bad as some. Why can’t these kids just get a sharpie pen and make it last for a week or two- that’s about as long as they are usually happy with them and before the regret sets in. Wow. She had a 5 star nose!